2 Parking lots on this block! 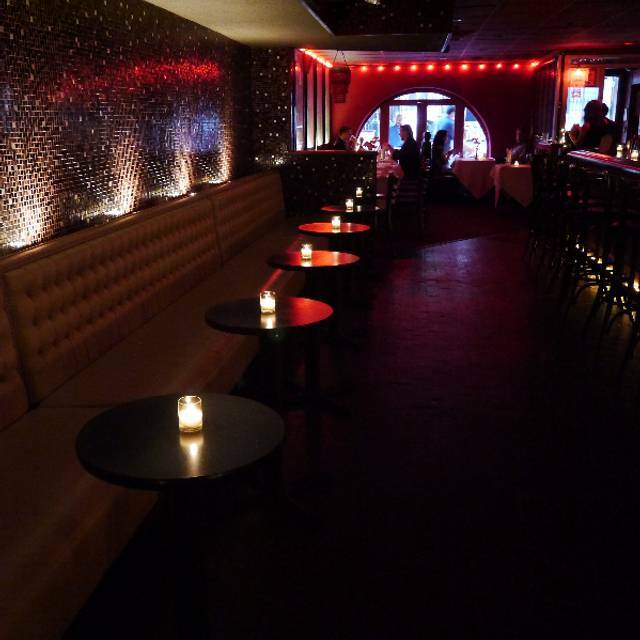 A Warm, Romantic and Intimate Dining Experience. Located on Restaurant Row in the Heart of the Theatre District, Times Sq. Our Menu offers a wide variety of Appetizers, Choice Cuts of Meat and Fresh Fish. Vegan + Vegetarian options are also featured. Dance Lesson, Swing DJ and Awesome Live Music Nightly! Front Dining Room Overlooking the Patio and Outdoor Patio Dining is always open for dinner + drinks where the live Jazz can be heard drifting from the Main Stage. A Live Music and Dancing Ticket Price of $15 - $20 at the Box Office for Main Room Seating. Bar + Dance Floor Open to 2am Friday + Saturday and Until 1am weekdays. This place is amazing..the lighting, decor, food, service, and most of all, the live music - all wonderful ! I've been to NYC many times but this was my first time to Swing 46. Our group of 12 with an age range from 35 to 82, enjoyed everything about this place! The food was awesome and the entertainment was off the charts! Great fun for all! Monday night, good food and great live music from talented band Swing-a-delic. Free dance lesson on offer too. Loved it! Really enjoyed great music and a nice dinner. Would love to see a gluten free menu, but the server asked questions to the chef for me and I was able to eat a gf meal. Swing 46 was a very pleasant experience. We went a 6:00 P.M. before a theater show and it was a little quiet. Service was good. Happy Hour drink prices were extended to the table which was a surprise. Food was very good. Seating was comfortable. We would return to this restaurant. Food was tasty, service immaculate but the star was the music supplied by the George Gee Band. Some might say it was cheesy but I think it was nostalgic of the classic big band era. Great to watch the dancers who were very good. We didnt EST hete, hence the 1 star. But this place has a really cool vibe. Amazing place, with great music and delicious food! Great atmosphere! The food was great and the price even better! Know that this is as expensive as purchasing theatre tickets. Choose your event. I expected to reserve dinner and not pay the service fee. NOT so, this fact is a bit hidden. There is a $20 fee per person on top of entire bill. We enjoyed a very good meal and even better entertainment at Swing 46. We even got to do a little dancing. And, to top it off, we had a super dance instructor teach us some basic steps between music sets. My girlfriend and I visited NYC and desired to engage in a memorable, fun and exciting experience: Swing 46 afforded us with the opportunity and so much more!!! Lo pasamos increíble, muy buena calidad de show, el ambiente agradable. It was a surprisingly charming and entertaining experience. We would definitely return. Suggest calling to double check when the band comes on -- ended up being later than expected. good food and the bar service from Marvita and Jonathan was friendly and interesting conversation. I have been to Swing 46 many times and have even had a surprise birthday party thrown for me there. The vibe is phenomenal! A Big Band music lovers and dancers gathering place like none other. Don't miss it! Honestly I never thought that a gem such as this place existed in NYC. My boyfriend and I came here for Valentine's Day. It was perfect! 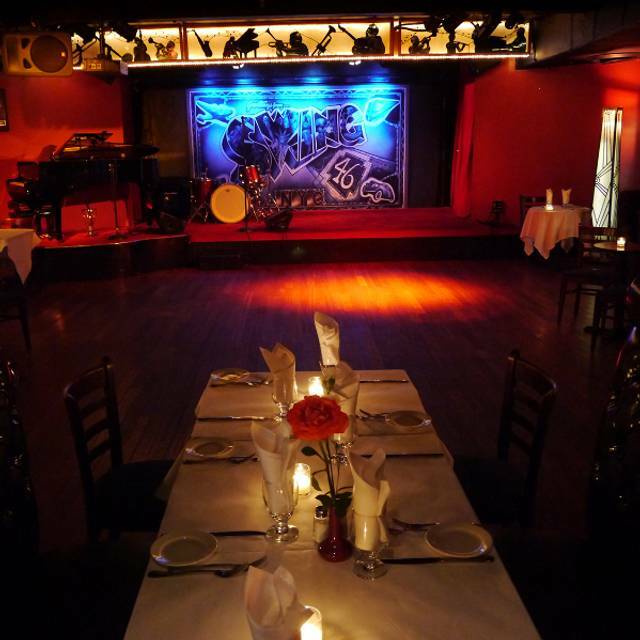 A place where there's a coat check, nice dinner menu, and a live jazz band! It's a great place. It's so classy and relaxing. I felt like Marilyn Monroe in a jazz club in the 60's. It's perfect for special occasions. If you're looking for a place where you can dance and have a fancy meal then this is your go-to place. At the entrance is a general lounge and bar, and further in the back is the restaurant, so you have a choice for what you want to do at Swing 46. I will definitely be back for sure. Great swing club...excellent music, free dance lessons and wonderful food. This is a great spot for fun and dance. Lively evenings made for memory-making occasions. Food and service are acceptable. Swing 46 was amazing. My wife had her 40th birthday there and she will never forget it. They made her feel special. The band played great and made us feel comfortable and welcome. Will recomend to all my friends and family.. The food was great, the steak was perfect. Good food, Live Band, dancing. What else do you need! So much fun. The staff is extremely attentive and friendly. The band was great. Extremely loud party of 6 very disruptive in restaurant. Wanted to leave. Food was subpar nothing to write home about. I cook better at home. Small portions. No recommendations for this restaurant. So disappointed. Didn’t stay for show only went for dinner. My beautiful wife and I wanted a dance and music night out in NYC. This fit the bill perfectly. Post-show Saturday night dinner. Service was lacking; waiter behaved as if the 4-5 tables who were all seated in his area were a nuisance. Twenty percent gratuity for party of 2 was added to bill. There was no indication anywhere that we should expect this and, as a result, after waiting 20 minutes for a check, and missing our Uber, ended up severely over tipping for not great service when we tipped on the total bill amount (the previously mentioned 20% included). Food was good. Great live music! A fun place. Very expensive. Nous avons passé un bon moment! L’ambiance était au rdv avec de bons danseurs et un bon groupe! Petit bémol sur la nourriture qui reste simple et le prix. Au moment de payer, nous nous sommes aperçu qu’il y avait 20 dollars par personne à régler pour avoir pu regarder le groupe. Nous n’avons pas été prévenu par avance. Le tarif est vraiment disproportionné ! Nous avons réglés 553 dollars pour 6 personnes pour 1 plat et 2 cocktails chacun! Je vous recommande d’y passer juste pour boire un verre afin de profiter de l’ambiance! Plenty of swing keeps the joint jumping! Swing46 is exactly what you want from a jazz club! 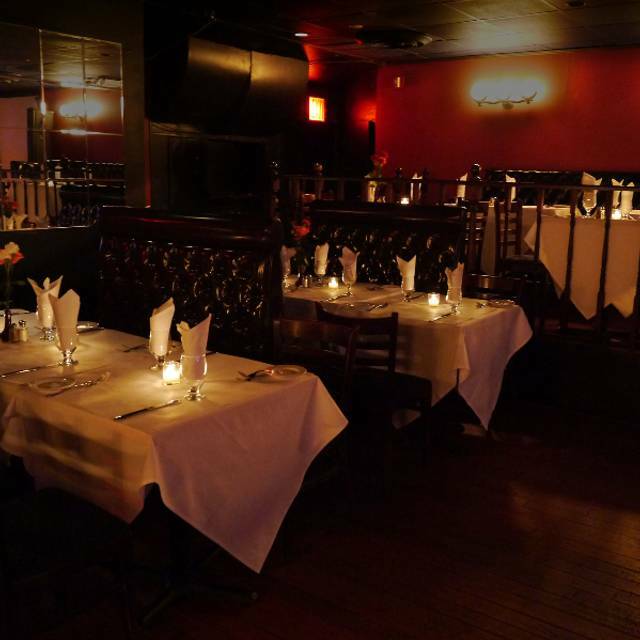 Intimate club atmosphere, great food, warm vibe with high energy. We had the pleasure of hearing Jazz singer Vanessa Trouble and her Red Hit band which was fantastic! Steve our server was super accommodating and happy to be there. In between sets they had a wonderful teacher give a swing dance lesson. This is a place where people come to dance. The food is very good. We had almond crusted calamari and coconut shrimp which was very fresh. We had the angus steak which was a large portion and the roasted half chicken. All the entrees came with two sides. Considering in the theatre district there are many tired and touristy places, Swing46 delivers the goods on fun and authenticity. Can’t wait to return. I requested a table for one and was looking for a place to listen to live music and Jazz, it turned out that we could also dance and I even danced that night , the food was great they had vegetarian options too and service very good, I walked from my hotel near Timesquare so it was very good. You go here for the music (the bands are always terrific) and the dancing, but the food is surprisingly good. We've been there four times and keep coming back! As a Special guest of the vocalist for the night, I wasn’t treated as one would expect and left. Their call to me to “make it right” was appreciated, but the manner of service and lack of attention to detail of my person will not allow me to return there.